DIY is something you don’t learn in school, and without a bit of trial and error, you may never learn how to do the simplest of things, but if you are a Scout you now have another badge to earn! 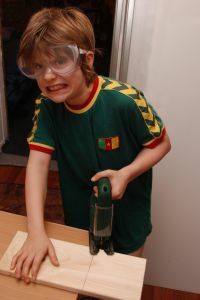 Their motto is ‘be prepared’ and this is one skill everyone will encounter at some point during their life, so the Scouts aim is to prevent children growing up without any skills or knowledge on how to do DIY. Each student will have to demonstrate different levels of basic DIY to achieve the badge, learning skills such as changing a tap washer, adjusting the float arm of a cistern (one I failed to do in France! ), and unblocking sinks. The scheme is part of an experiment with home improvement firm B&Q. The more advanced skills, which are age appropriate, include insulating a cold-water storage tank, pipes and hot water cylinder, along with preparing and painting woodwork and furniture. I don’t think I can do many of them, I am pretty useless when it comes to DIY! It is not just DIY they will be learning, the Scouts will learn the importance of sustainability, for example using responsibly sourced timber. The Scouts are operating in every country throughout the globe and able to boast 28 million members, but with such numbers and the government recently announcing they will cut global warming from the school curriculum, could this be something taught in the Scouts? I think that if the Scouts are learning about key life skills and sustainability, then being energy efficient and living in an eco-friendly manner is an important skill to be instilled in our youth. After all they are the future of this world we live in, the last thing we want is a world being destroyed by our own actions! By teaching them DIY, why not teach them about energy efficiency within the home; what improvements can be carried out to make it more eco-friendly? Either way I am thinking of joining the Scouts, I haven’t been unable to have a shower in the evening for the last few weeks because I can’t figure how to get the bulb out to change it! Useless. Anglian Home Improvements raising the standard since 1966. Visit the Anglian website for information on our EcoGain windows.